This past Saturday, Discovery Channel's semi-scientific investigation program Mythbusters presented a video game special. 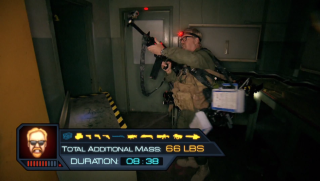 Over the show's hour-long running time, including the pre-commercial 'coming up next' teasers, the post-commercial recaps of what was shown before the commercials, and the narrator bringing the show to a halt to repeatedly restate the goals of the experiment, Mythbusters invented a myth about the video game Doom and attempted to 'bust' it. Here's a trailer for the show, which will be followed by me completely spoiling the contents of the episode. The myth in question: can a space marine really carry around all those weapons and ammo without the added weight slowing him down? While I fail to see how that's a 'myth,' it's still a valid question and one worth investigating. The two hosts of Mythbusters, the excitable Adam Savage and the inhumanly deadpan Jamie Hyneman, tackled the challenge despite Jamie having apparently never heard of Doom and despite the Doom footage shown actually being from Doom 3. They begin by constructing a 16-room Doom-ish level in a warehouse on the Mare Island Naval Base. Tim Willits from id Software arrives and recreates the Mythbusters level in the Doom editor, for some reason, before quickly vanishing from the show. The level is filled with people pretending to be monsters, and scattered around are nine replica weapons that fire foam darts. Jamie and Adam both run through the level once, putting down a weapon every time they pick up a new one, and then repeat their runs while this time collecting and carrying an accumulated 80 pounds of guns. As you might expect, carrying around the added weight of the weapons slows down both Adam and Jamie and doubles their completion times, though they both appear to have a lot of fun shooting darts at extras dressed as zombies. Finally, they invite a large and muscly mixed martial artist named Brendan Schaub to serve as a closer approximation of a space marine. Though he appears winded at the end of the experiment, carrying around all those weapons doesn't have a detrimental effect on his time. The Doom myth invented by Mythbusters, therefore, is deemed plausible. Hooray! Or, boo? I don't know which result we are meant to root for, really. Also of note: Schaub is very skilled at shooting people in the dong. You can check out clips of the show, each proceeded by an advertisement for Hershey's chocolate, imbedded on Discovery's site. You can also purchase the episode on Google Play or look for it on-demand from your cable provider or wherever else it is you retrieve and watch cable television programs.